I participated in an “ugly” fabric challenge in 2009. The challenge fabric was roses strewn across a green background. I fussy cut the roses and wove them around a “wicker” trellis. The roses are machine appliqued/quilted with invisible thread. The trellis is stitched in place with a small satin stitch. 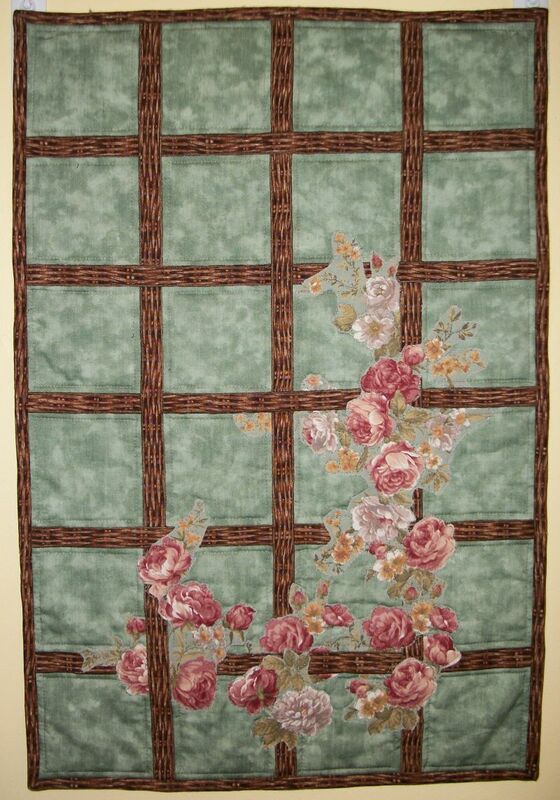 It is then quilted 1/4″ inside each of the spaces created by the trellis. The quilt measures 15 3/4″ wide by 23 1/2″ long. It hangs over my work computer. I’ve entered this quilt in Quilting Gallery’s weekly Quilters’ Show and Tell. Please take a look at the quilts and vote for your favorite.